Well, here we are, a week further on. 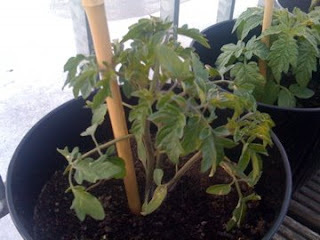 They've been through the mill with the potting process, have established their roots and are now starting to accelerate. I've noticed a thickening of the stems, plenty of strong leaves and I now expect them to be shooting upwards. I've noticed the odd side shoot trying to make its way between the side branches and so have pinched it out immediately. It has been a difficult week in Hamburg for those of the tomato species. Windy and cold weather, particular felt on a balcony high above St Pauli. Tough living. 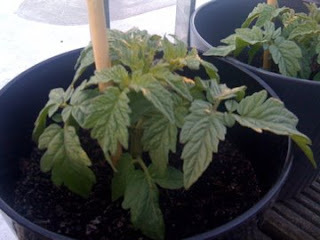 But, I think with this kind of upbringing we will breed tough tomato plants which will generate succulent fruit in the sunshine of July and August. You've so far seen 6 in pots. Tomorrow is a big day as I'm going to buy another 6 pots and plant out the remaining plants from the seedtray that been growing ever more vigorously. Photos to follow.